But I realized, there’s just one thing missing: a two-way conversation. I suppose I haven’t said anything very controversial, so many of you might not have a strong urge to participate in the comment section – maybe I should change that. 😉 But when I first created the site my hope was to start discussions that would catalyze readers to start their own conversations – whether amateur dancers with professional dancers, ballet ignoramuses with ballet connoisseurs… whatever. Something with a life of its own. Obviously I have some work to do on that front. 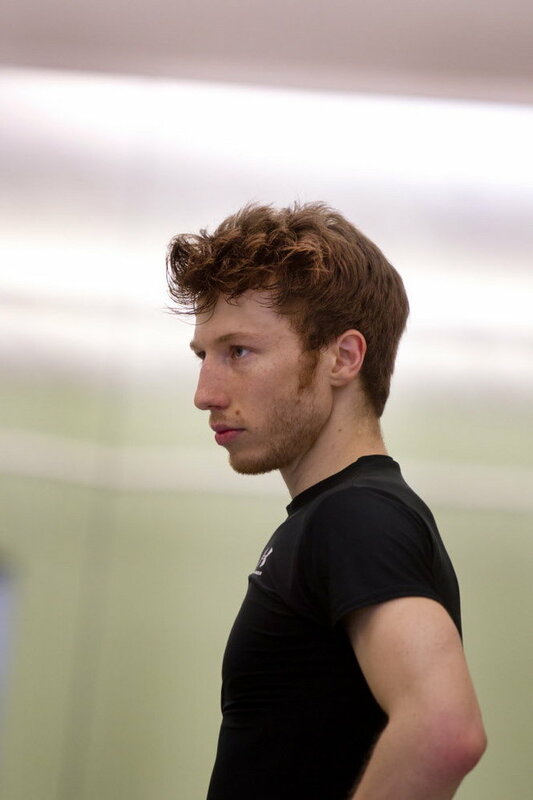 So, in this post, instead of me talking to/at you, I’m going to invite you all to ask questions about the ballet world. What are you curious about in the life of a ballet dancer? Maybe you are a dancer – is there anything you want to know about Les Ballets de Monte Carlo, where I work? I mean it too, I really would love to hear from all of you. If you’re following this blog, there’s a reason behind it. Here’s your chance to explore your interest in the topic a little more deeply. We have dancers on standby. Ask me/us anything: nothing about the ballet world is off limits here. Want to know how much ballet dancers make? Sure. Whether ballet dancers fall in love with each other easily? Good question. If you’re a dancer: Want to know what kind of work we do at Les Ballets de Monte Carlo? Where we tour? Ask away. This blog post is your blog post! Always watch out for dancers. They can be very sneaky. I have never danced, though my mom danced for over 20 years and its still so clear that its one of the things she will love forever. she and i recently started doing yoga and i have noticed she is incredibly flexible despite not having dance or even streched for at least 5 years. i played soccer for 10 years and can barely do a split! i guess my question, if it makes any sense, is do you see a connection in yoga and dance? have you ever done yoga to help with your dancing? I really don’t know if this makes sense, sorry. Absolutely there’s a connection between yoga and dance! Many ballet dancers do yoga (or pilates) outside of their workday, because it helps them strengthen other parts of their bodies and gives them another approach to movement. On a more basic level, both yoga and ballet require a strong connection to the ground (this is true of any physical pursuit), both develop flexibility, and both require a strong mind-body connection. I have done yoga (at one point regularly, about once a week) to help with my dancing. One of many ways to cross-train. It makes sense that your mom is still flexible – we often say “once a dancer always a dancer”! Soccer doesn’t stress flexibility quite as much though, so don’t worry that you can’t do a split – if you keep on practicing it will come. i think its interesting that both dance and soccer are rigorous sports (if you consider dance a sport?) that both require so much training, but yet they affect the body so differently. for instance, i can’t do a split for the life of me, while my mom can. but my mom doesn’t have very good hand-eye coordination and can’t throw or catch a ball at all! though both sports, definitely teach the body strength and self-discipline. Sadly, i cannot play soccer anymore, because among other things, i had several brain injuries while playing about four years ago. it greatly saddens me, because i wanted to go pro. however, i still love the sport in that i watch games still and might even begin coaching! As for yoga…i used to not like it so much, because i disliked the thought of “sitting and doing nothing” which i realize is the wrong way of thinking. because now, i do it 3-4 times a week, and i am so much more connected to my body and i already feel my leg strength coming back. (after my injuries, i didn’t even exercise for almost a year). And while i am not that flexible (yet) i have amazing balance! some poses i’m like….”wait. my body can do that?” it’s really an amazing thing. anyways, sorry for blabbing and going on a tangent, but i totally understand how yoga can help with dancing. But if there’s one thing that’s more important than anything else, it might be the fact that it brings you and your mom closer. Are you in love with ballet music as well as the movement? I’m not a professional dancer but I love to dance and for me, music is everything. If I don’t feel it, it’s going to show through my body. So, do ballet dancers have a passion for classical music ballets? If not, do you have to fake it? That’s a great question! I often enjoy the music from the get-go – it’s rare that choreographers choose classical music (modern music is another story) that isn’t really beautiful or interesting. Although it’s true that sometimes there’s music that isn’t especially inspiring. And at that point you have to dance on 🙂 but the thing about our work is that you work so intimately with the music, that at a certain point you end up loving it because you get to know the intricacies of a piece after hearing it hundreds, if not thousands of times. Pieces like the Rite of Spring by Stravinsky, which can be really rough on the ear at the beginning become beautiful because you get to know them and understand them. Other pieces, on the other hand, get me moving right from the start. We’ve been rehearsing a ballet with music by (the artist formerly known as) Prince lately, and since I love me some good funk, I can help but move when I hear it. That certainly helps me get in the mood. Okay, I am taking the plunge, and asking you a question that may have occurred to many ‘ballet moms’ (and dads) as they saw their children mature through the discipline that is ballet. Our childhoods were very different, as you know, but I still remember coming upon a scene of you with several female ballet classmates, watching something or other on the TV downstairs…you were all draped comfortably on or alongside each other, like a pile of puppies, I remember thinking. I could not help but wonder how natural it seemed for all of you, and being somewhat envious. Had my mother entered the room when I was in such close proximity to a boy at that age, he and I would have sprung apart instantly, cheeks blushing, though we had not actually done anything even remotely sexual. So my question is, how is it to grow through adolescence with such familiarity with your colleagues, physically? Does your training allow you to be more at ease with your body, by yourself and / or in relation to others whom you embrace and interact with so closely on a daily basis? You can always count on mom 🙂 good question though too! Yeah, I would say that since our training involves physical contact with each other we naturally become accustomed to touching each other. So that becomes a part of the culture, although of course there are varying degrees of comfort in ballet culture. I have friends that kiss on the lips (nothing sexual, can you believe it?) to greet or thank each other, while others are a little more conservative with their physical intimacy. But our comfort with this physical relation to one another translates outside of dance culture as well – sometimes our ways of relating to others can be too intimate in the minds of the rest of the population and so occasionally some can be offended. (I’m mostly talking here about jealous boyfriends/girlfriends). All this within the boundaries of respect, of course. Any dancer can tell if an action is made out of respect, as opposed to lust or objectifying; groping is completely unacceptable. But that doesn’t mean that every dancer is at ease with their bodies. One of the undercurrents of ballet culture is a dislike of (or at least an insecurity about) one’s own body. So our comfort with physicality between us doesn’t necessarily translate into an acceptance or happiness with one’s own body. Would you describe some of the differences of being a dancer in Monaco and in America? I am interested to hear your perspective. Some ideas: creative process, professional relationship to colleagues, contact to audience, social life, quality of life. Thank you for your input, and for your excellent articles! Thank you Lucas! It’s so exciting to hear about your experience! It’s true that the historical importance of theaters in Europe are a big inspiration. Thanks for linking the article! I hadn’t seen that one. And you make some excellent points. I’m always thrown for a loop when a European company schedules performances of Nutcracker in July; very weird. Can you describe a bit of your experience wirh social life as a dancer? Are your friends mostly within the company in Monaco, or can you meet people within the city? How does it differ with your experience in the states? And how about healthcare? Do you have access to good physical therapy? I have found that in Europe, PT is pretty much equivocal with massage, and if you want ultrasound or actual treatment, you need to push for it. Interesting question. I’m curious to know in what way you mean that your partner is less competitive than you. Is this in terms of motivation? Of willingness to practice? Who are you competing with? For ballet dancers we obviously have many challenges. But one thing that I consistently see amongst me and my fellow dancers is an expectation of always being 100% on top of our game. Often we’re so harshly self-critical that we beat ourselves up when we have a rough day, an extra punishment beyond what is already happening to us in that moment. I’m actually in the middle of compiling several different accounts of what it means to be a dancer and the challenges that come about with this life. So stay tuned – that way you can get six different answers to your one question! I am a high school aged dancer who, after training seriously for many years, realized that dance was not my life’s calling. I took the time to explore other aspects of my life and cut back the rigor of my dance schedule, and I know that I made the right choice. I’m happy. At the same, though, there are definitely days when I see my former classmates perform, or I watch a variation being performed online by someone my age who is much more talented, and I struggle with the idea of not being good enough. Part of the perfectionist drive that ballet instills in us is still in me, and it raises a unique kind of introspective pain. There’s a longing there because I still love ballet. This is something that I think only those who have danced will fully understand. My question, then, is do you agree with the idea that you can love ballet and still not make it your career? Thanks so much for your reply! Since I wrote my last comment, I have actually been given a position as a teen ballet teacher. I’m teaching once a week to recreationally-focused students, and I love it. If and when you do write an article about the topics we’d discussed in January, I’d definitely love to share it with my director and to apply what you have to say to my teaching. I think it’d be a big help. Thank you again for taking interest in my studies! Michaela, I wanted to make sure: is it ok if I include your comment in my next blog post? If I don’t hear from you soon, I will post it and you’ll probably see it then, but I just wanted to check with you here first 🙂 let me know if you see this. Yes, that would be fine! Thanks for checking, though. Can’t wait to read your post! Do you have any photos you might want to include in the article? If so, please send them to the Corporal Culture email account! Total dancer question: Do you have (or know of) any funny/memorable partnering stories? Any cringeworthy fails to speak of? I, fortunately, do not have any, although I did end up partnering with my former dance teacher for a Nutcracker this past December. (He is old enough to be my father and I was obviously a bit nervous in rehearsals because I respect him very much. Nonetheless, it worked out fine and he was both professional and a good influence on my dancing.) What advice do you have for younger dancers based on pet peeves from a male dancer’s perspective? I’m a 17 year old ballet dancer who’s really confused about her future in dance. I started ballet as a kid doing a weekly class from ages 5 to 8, but I stopped in order to do musical theater and focus on my academics. I didn’t start ballet again until high school and I’m averaging about three hours a week of a ballet. I really do love ballet and I only just got my pointe shoes this week, but I’m not able to dance as much as I want to due to my rigorous curriculum (all of my classes are International Baccalaureate courses). I really want to focus on ballet in college/university and take daily lessons, yet I have no idea of what sort of programs to look for. I’m not looking to become a professional, but I would like a program where I can improve and perform without having to spend outside of my tuition. Do you have an ideas or advice?